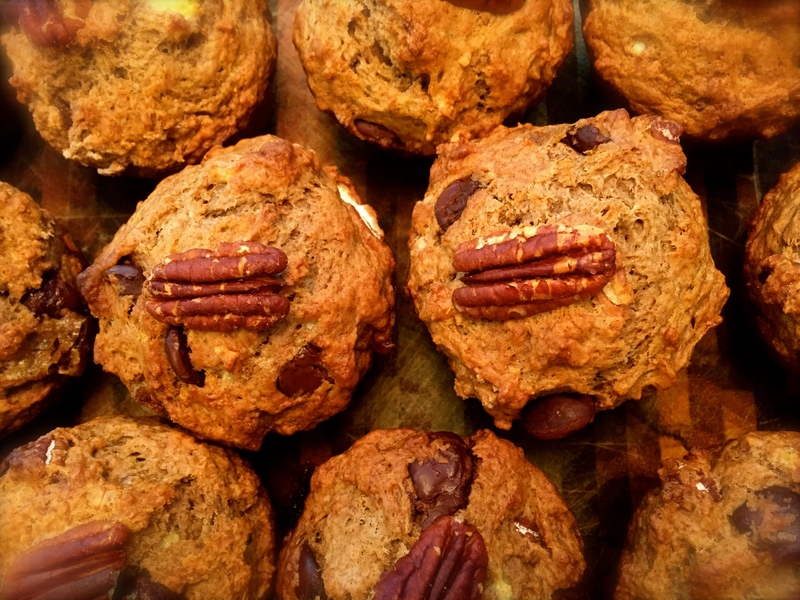 Light, airy and just the perfect combination of banana, pecans and chocolate chips. Of the numerous banana bread/muffin recipes I have, this one is probably my very favorite. I came across the recipe years ago in a small cookbook titled “Muffins A to Z” by Marie Simmons. This book is a great resource for muffins, and all of the recipes I’ve tried, turned out perfect. Many times though, I like to experiment and interchange fruit additions, reduce the amounts of sugar and fat, or substitute a “flax seed egg” for the real thing. In this recipe, I reduced the sugar by about half, and substituted canola oil for melted butter. If you want vegan muffins, use the flaxseed “egg”. It works really well and you can’t tell the difference. You can have these muffins on the table in under 45 minutes from the time you start gathering your ingredients until you take them out of the oven! Preheat oven to 400° and lightly oil 12 muffin cups. In a large bowl, combine the flour, baking powder, baking soda, cinnamon, salt, chocolate chips and chopped pecans. Measure the canola oil in a large glass measuring cup. Add the egg and whisk until well combined. On a plate, mash the bananas and add them to the sugar-oil-egg mix. Combine well and pour into center of the flour mixture. Stir until just combined and divide evenly between the muffin cups. Bake for about 20 minutes or until a wooden toothpick inserted comes out clean. Remove from oven and let cool in pan for about 5 minutes. Remove muffins and let them cool all the way if you can wait! These muffins can also be baked in small loaf pans. The baking time is about 30 to 40 minutes for those. Chopped hazelnuts are also really nice instead of the pecans. I will have to take the 5th on the Robbie and the muffin story! 😉 Applesauce works well in baking, though I don’t often use it. Sometimes I use almond milk instead. For these muffins however, a little bit of oil adds flavor and makes for a nice texture. He sure likes the muffin! Yes he does! Thanks for stopping by. Yum. I love the idea of the pecans with the bananas. I usually use walnuts, but the pecans would be a riff on Banana Foster. Side note: I happen to be acquainted with Marie Simmons. She was one of our instructors at a cooking school in Eugene that I was involved in. Thanks, Sabine! Lucky you to know her! I also have her book “Quick and fast vegetarian”, which has some really good recipes in it. If you talk to her, let her know that I am a big fan! If I have a chance, I will. As a southern gentleman, I must say I am mightily impressed by this show of baking prowess! I reckon I could do with a good dozen please, at yo’ earliest convenience.